Anybody follow cycling? 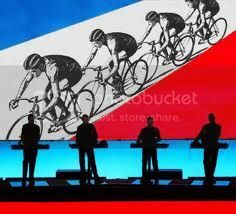 Wiggins looked good in the Dauphine, but I think all the other guys looked better in the Tour de Suisse. Contador is probably still pretty tired from winning the Giro so I think that's going to make it a more exciting race this year. We've got a couple of Americans that I think can pull a top 10, but I'm doubtful on podium spots. Leipheimer in third would be the best we could hope for there I think. Levi due a podium - would love to see that. Watch him in the TT. Agree on Contador, and they are not going to make it easy for him - did you hear the boos' in the Giro? Two South Africans on the Sky team (Chris Froome & JohnLee Augustyn) but they didn't make the cut. Wiggins is definitely a contender. Would be nice if George Hincapie got a stage - he equals the record for TdF starts (16) this year. I'm going with Andy Schleck. I figured you woud pop in here and say something. Damn, I thought this was going to be a discussion about Kraftwerk. IMO not one of their finer moments.